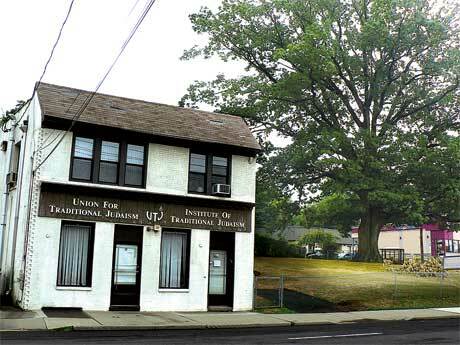 The Union for Traditional Judaism sold its Teaneck headquarters at a bankruptcy auction last week, despite recent controversy surrounding a centuries-old tree on its property. UTJ, which also runs the Institute for Traditional Judaism, is looking at two possible rentals in Teaneck. The union has six full-time employees, while 12 students are enrolled in the ITJ. That number is expected to increase in the fall with the launch of distance-learning programs. Because of its small number of regular employees, UTJ is looking at locations one-quarter the size of its current building, or about 1,500 square feet, Price said. “Because the ITJ is doing so much more work online and giving a lot of emphasis to distance learning, the space requirement is substantially less,” he said. Judge Robert Drain ruled on Aug. 4 in U.S. Bankruptcy Court in White Plains, N.Y., that 333 Realty had won the auction with its initial bid of $1,450,000, since no other bidders stepped forward. The court has to hand down a written ruling, however, which as of Wednesday had not been issued. Once that is issued, 333 Realty and UTJ will have 30 days to close on the property. According to Janice Grubin, the attorney assigned to UTJ by the bankruptcy court, 333 intends to develop the property commercially, but she offered no other details as to the fate of the property or the old oak tree. “The debtors are delighted at the approval of the sale to 333 Realty and look forward to consummating the transaction and moving ahead in their reorganization,” she said. UTJ declared bankruptcy in May and its leaders decided to sell its headquarters to cover its debts. Controversy erupted last month when the union began work to remove a large oak tree that towers over the property. Union leaders argued that safety concerns prompted them to seek the tree’s removal, while the tree’s supporters argued that the removal was a ploy to get more money for the property. The tree, estimated to be between 200 and 300 years old, is considered the oldest in Teaneck. Spurred by protests and petitions by eco-activists, the Teaneck township council took up the issue at its July meeting and considered making a bid on the property to save the tree. The council, however, decided that it could not justify the expenditure of $1.5 million for the property, given recent budget cuts, nor could it stall the bankruptcy court while it investigated other options to save the tree. Though the township decided not to intervene, UTJ left the tree up through the auction. It will now fall on the new tenant to decide the tree’s fate. She would not elaborate on what those factors were.